In a discussion on the Ephotozine forums about Phil Smith being stopped by Ipswich police and requested to delete his images, one site member, Dave (going by the pseudonym of Mad-Dog's) detailed a card he carries summarising the law concerning photography in the UK. I have created my own version of the card and you can download it as a jpg from here. Printed at 300dpi this should produce a credit card sized document that you can easily carry with you and may help you challenge any over-zealous police officers you may meet. 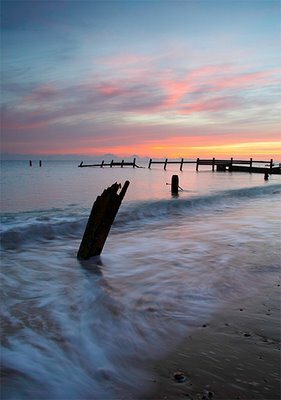 Regular readers will be aware that I am a member of The Painting with Light Society - A group of Landscape Photographers from East Anglia. There are eight of us in the group including such talented folk as Jon Gibbs who won Landscape Photographer of The Year and Ian Flindt who had five pictures Highly Commended in the same exhibition. Our latest exhibition has just opened at The Stable Gallery, Kelling, near Holt. The Exhibition runs from 24th Nov - 23rd Dec. The exhibition will feature the work of all 8 members of the society together with prints from a guest photographer, Kate Barclay. In total over 40 framed prints will be on display. Framed or Mounted prints will be available for purchase so why not pop along for a look if you are in the area. Not convinced of the need for Raw? I often see on forums, people saying that they have shot both raw and jpg and can't see a difference. An additional comment, since Lightroom has entered the fray, is "Lightroom handles jpgs and raws..so why bother with raw?". Over at The Luminous Landscape, Michael Richeman has produced a great example of the difference between the two formats when you actually do the same processing on them. 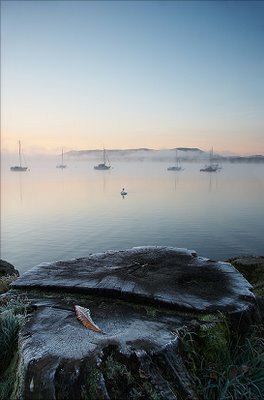 PhotographyVoter.com (PV) is a great site that allows you to see what's new in the world of photography. Stories are voted on by the sites members so it helps you find the really interesting stuff easily. Sign up with Feedburner and set your site feed up to use feedburner (all the instructions for this are on the feedburner site). That's it! I hope you find it of use. 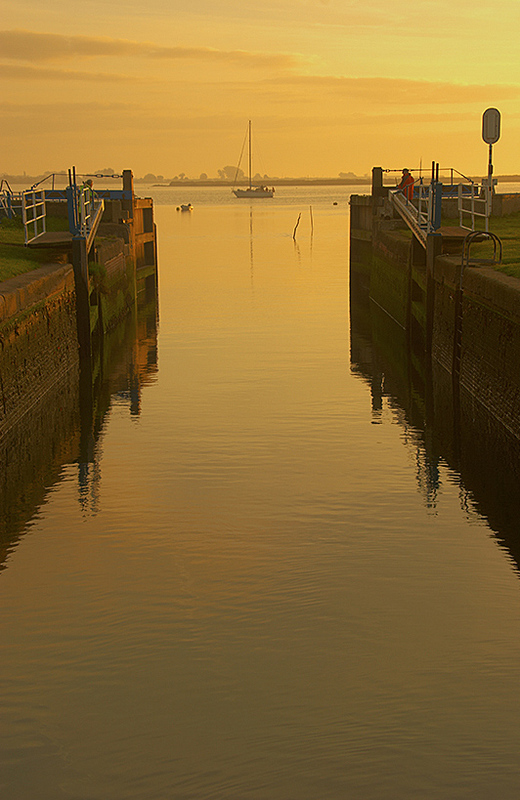 Sunday morning I got up early (4:30am) and headed down to Heybridge Basin to see if I could get some dawn shots. 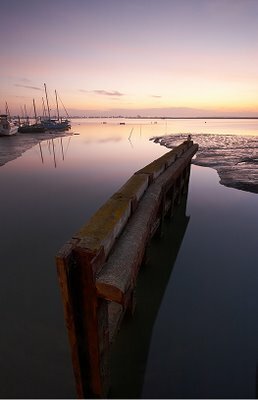 Heybridge basin is where a canal (the Chelmer Navigation) meets the tidal estuary of the river Blackwater. A sea-lock connects the two, when there is a high tide. The river itself is surrounded by high sea walls and for most of the time the tide is out. So it is not an easy location to shoot, but I had planned my shoot for a time when high tide coincided with dawn. The night before was the Saturday nearest to Guy Fawkes Night, which means an awful lot of fireworks. I'm sure this is a lot of fun for a lot of people but for us it's a pretty retched time as you try to comfort two terrified dogs, who get really stressed out by the bangs and occasionally throw up with the stress...which is nice. In the middle of this mayhem I was trying to pack my gear for the following morning. I packed carefully, following my checklist, but when it came to the point of checking if the batteries were fully charged I looked at the camera and it said 3/4 full plus I knew I had a spare battery in my kit so, with all the rest of the hassle that night, I didn't bother....big mistake! Things started off well with me perching on the edge of the lock to get an image as the sun started to rise over Northey Island. Then the most remarkable thing happened, as the tide started to rise the place burst into life, the lock keepers appeared & started to open the lock, boats started to move and even the pub opened..all at 7 o'clock in the morning! Obviously high-tide is the only time that boats can get in and out of the basin and so people have to build their activities around it. Realising that it wouldn't be long before a boat made it's way towards the lock I positioned myself on top of the rear lock gates and waited till the boat came in to the exact position I needed it to make the composition I had set up complete. Now all I needed to do was wait for the boat to come in to the lock and I would get a nice series of pictures of the boat locking in fantastic light. At precisely the wrong moment my battery ran out. So I quickly opened my pack and got the spare out...which was flat too! I had no choice but to pack up and walk away, muttering to myself about the one that got away. Lesson learned - always check your spare battery has charge. I hope you can learn from this and don't suffer a similar fate yourself. I was asked by Chris Herring if I could help him get the iView and payPal template working on his site. Having finished the job I thought that I would make it available to everyone who wants a different look for their iView Paypal galleries. To use it just follow the instructions here but use this file instead of the paypal.zip file mentioned. I hope you find it of use and if you do use these galleries on-line please let me know and I will be happy to link to them. It has been pointed out to me that version of my Limited Edition Management system Lemon that could be downloaded from the download page, was not the version stated. Well it turns out I was caught out by a case sensitive webserver, it should be sorted now so those of you who need it can download Lemon version 1.1 here. If you are a regular viewer of UK photography, as I am, you often see the same locations appear time and time again. This is often due to the locations being close to the road. Peter Heyes avoids the easy option of standing at the bottom of a mountain to take a picture of it, instead he climbs it in all weathers to produce images of amazing beauty. His website is full of fantastic images of the mountains of Britain and is well worth a look round for all the amazing images of these wild places.